the slender arc with thick rounded sides, carved at the top with a stylized bird head with large protruding eyes separated by a shallow tapering groove extending from the forehead down to the hooked beak, and with a pair of ear-like tufts rising at the back of the head, drilled high on the neck with a transverse suspension hole, the translucent onion-green stone with softly polished lustrous surface. 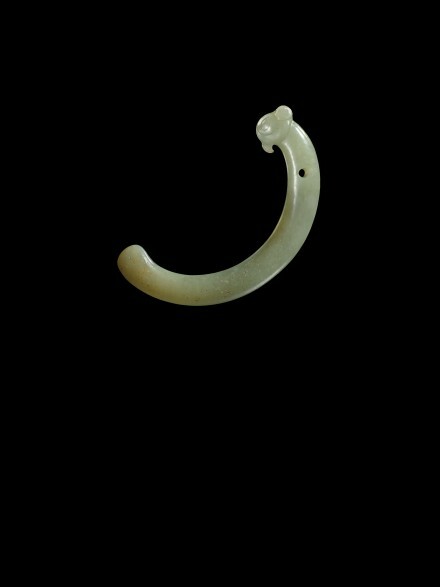 Compare the small jade pendant similarly carved with a compact rounded animal head with protruding eyes and a pair of small ear-like tufts at the back of the head, also drilled with a transverse hole for suspension, in the Tianjin Art Museum, illustrated in Zhongguo yuqi quanji (Compendium of Chinese Jades), Vol. 1, Shijiazhuang, 1992, p. 14, no. 17, with caption on p. 222 where it is classified as Hongshan on the basis of the type of stone and style of carving.